Irvine, CA – Bluefin, the leading North American distributor of toys, collectibles, and hobby merchandise from Japan, Hong Kong and more, offers Star Wars fans and ardent collectors something unique as it highlights a variety of super-detailed figures from the Meisho Movie Realization Star Wars line by Tamashii Nations. 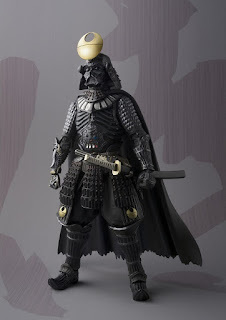 The Meisho Movie Realization Star Wars line pays homage to the Samurai aesthetic and artfully reimagines several Empire characters from the legendary films with feudal-style Japanese armor and weaponry. Each figure is exquisitely crafted by some of Japan's top sculpting talent and constructed with hybrid materials featuring up to 15 points of articulation to create endless posing possibilities. Fans that want to dive into the Meisho Movie Realization Star Wars line immediately can select from a trio of figures – available now – that includes the “Ashigaru” Stormtrooper, and the Samurai General “Taisho” Darth Vader. Each is clad in a unique set of armor and comes with an array of weapons and other accessories. An exquisitely rendered figure of Darth Vader portrayed as a Japan feudal era Samurai General. 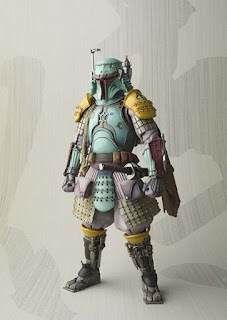 A unique artistic interpretation master crafted by acclaimed artist Takeya Takayuki, this original stylized figure pays homage to the Japan aesthetic and film influences on Star Wars. Tamashii Nations' Movie Realization brand takes the theme of movies and infuses that concept into high quality figures. And the secret ingredient? All figures have an added pinch of "wa" (Japanese style) that makes for a one and only, unique design – from the tip of his sharp lightsaber-turned-katana to the meticulously sculpted Samurai-esque armor. Look closely at Vader’s helmet and one will notice the Imperial insignia arranged in elaborate “wa” style. Set includes two interchangeable lightsaber parts and 3 sets of interchangeable hands perfect for posing the Samurai-styled Sith Lord as he manipulates the Force. In this interpretation, Samurai Vader's foot soldiers of the Empire come clad in far-gone Japanese feudal era attire and armament. The exquisite figure has been master crafted by Japan's top sculpting talent and features hybrid materials used for dynamic posing possibilities Set includes katana and blaster rifle accessories, as well as three sets of interchangeable hand parts. Based in Irvine, CA, Bluefin built its reputation as a leading distributor of Japanese toys, collectibles, novelty and hobby products. In recent years, Bluefin has grown to include a range of high quality collectible lines from the United States, Hong Kong, Taiwan and Singapore and established itself as the official North American consumer products and retail development partner for Studio Ghibli. Selling to thousands of specialty, chain and independent stores, Bluefin is an official North American distributor for Bandai Hobby, Kotobukiya and Capcom, is the sole provider of Bandai Tamashii Nations products, and is also the exclusive and official distributor for Hero Cross, Beast Kingdom, Comicave, Mr. Hobby, Groove’s Pullip dolls, SEN-TI-NEL and X-Plus. Bluefin also represents TruForce Collectibles products worldwide. Additional information is available at: www.bluefincorp.com.